Press Release : Ircam Lab announces The Snail! Today Ircam Lab has proudly announced the release of their revolutionary new software, The Snail. This modern looking Tuner/Analyser software offers a new and extremely accurate way of tuning and analyzing an instrument; displaying intonation and visualizing music and sounds in a way that can help anyone improve their listening and intonation. 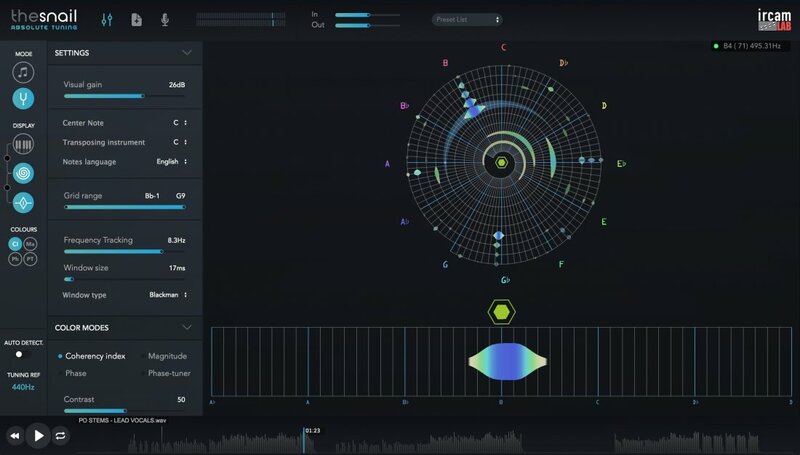 The Institute for Research and Coordination in Acoustics and Music (IRCAM) today proudly announces the launch of their new Tuner/Analyser software called "The Snail" due to it's cool spiral interface that represents every note of the scales rolled up from the highest to the lowest audible frequencies. The Snail is a very high-precision frequency-domain analyzer that delivers an easy to understand representation of sounds based on the scales and notes aligned in spectrally active zones. Resulting from numerous years of research and development, this product is based on a recent patented technology, conceived at the laboratory of Science and Technology of Music and Sound IRCAM-CNRS-UPMC based in Paris france. Compared to standard spectrum analysers based on Fourier-type analysis, the Snail's frequency accuracy is enhanced by a process based on the demodulated phase. Basically, the exploited principle is as follows : If a sound includes a sinusoidal component with frequency 440Hz, the demodulated phase, stemming from a Fourier analysis at frequency 440Hz, will remain exactly constant (as a synchronized stroboscope renders a rotating object immobile). Think of a film camera turning at 24 frames per second filming a bicycle wheel turning at 24 revolutions a second, the spokes will appear to be standing still. That means, for a Fourier analysis of frequency at 439Hz compared to a tuning reference of 440Hz, the demodulated phase will turn at 1Hz (as a slightly desynchronized stroboscope makes a rotating object that has a slow movement). Think of audio signals 'beating' as there is a interference between two sounds at slightly different frequencies. This principle is used to build a coherency index in the software, in such a way that a high value is associated with an acceptable deviation, typically adjustable from 1Hz to 10Hz. A dedicated algorithm exploits this coherency index in several ways. It improves the frequency precision at an adjustable rate. It lets users fine-tune the accuracy of the tuner and therefore goes way beyond the global stroboscopic techniques used in some expensive tuners. The Snail analyses all the local spectral components of a sound and renders this information in a convenient visual form. Users can finally see ALL the surrounding frequencies and overtones as well as the basic fundamentals delivered by a sound. The Snail delivers a new approach in "tuning" as it also analyses inharmonic sounds by representing all of it's added harmonics. An old guitar string can be immediately identified as you see it's resonance that is out of tune and can cause some notes to be more or less present (ringing) than others. If you've ever had a guitar that never seems in tune as you change scale or move up the fretboard or found a resonance that you found was a problem? Well, now you will finally be able to see it! The Snail shows the fundamental notes and all the associated resonances and harmonics of any instrument or sound in an easy to see graphic display. It will for example help users see all the notes and harmonics played during an audio playback along with their intensities, so they can figure out what key the song is played in. Isn't that cool? - It's a Tuner, but one that will give a whole new insight into what tuning is all about. - It will without doubt give your ears a training that will open them and educate them on how to tune for your own style of playing. - You will be able to find out what pitch any instrument or percussion is set at and help you to 'fine-tune' it to your needs. Its incredible analysis engine can even show you the composition of the harmonics of your own voice. - No song or instrument will be able to hide its chromatic makeup from you any longer. The Snail will give you a new insight into the personal secrets of every sound and musical composition that exists. - So if you want a real accurate tuning, The Snail is the way to go... Absolute Tuning! The Snail is available at the introductory Price of $49 (List price $99) until Monday February 29th.